Have you ever been at a meeting about a community issue and heard the statement, “We don’t need some outsider coming in and telling us what to do”? I know I have. This phrase points to a common challenge I see when working in rural communities—balancing the value of community input with expert knowledge in community design. Too often community projects favor one of these approaches over the other; the design team who drops in for a week with the solution to a town’s traffic woes (i.e. roundabout) or the community workshop that recycles the same, old idea for its downtown’s redevelopment (i.e. more parking). So, how do we move off of this dynamic towards a more effective model? By recognizing the best of what both sides bring to the equation and designing a process that leverages both strengths. Let’s talk about what community members offer to the design process. Local people know their town best. Their insights will inform a project in many ways from identifying community values to brainstorming and prioritizing possible actions. Research shows us that many minds lead to better results. So, the greater the diversity of people contributing to solving a problem, the more creative and effective are the solutions. This is particularly true for more complex issues that community design addresses like downtown revitalization or growth management. In addition, community members need to own the outcomes of a design process if those outcomes are going to be effectively implemented. There is no better way to ensure ownership than to be part of shaping the solutions. When citizens are effectively engaged in a design process then designers and planners can be their most effective too; facilitating a process that synthesizes local experience and wisdom with design principles and technical expertise. Designers can help people uncover their common interests and work towards practical, creative solutions that build on local character and assets. 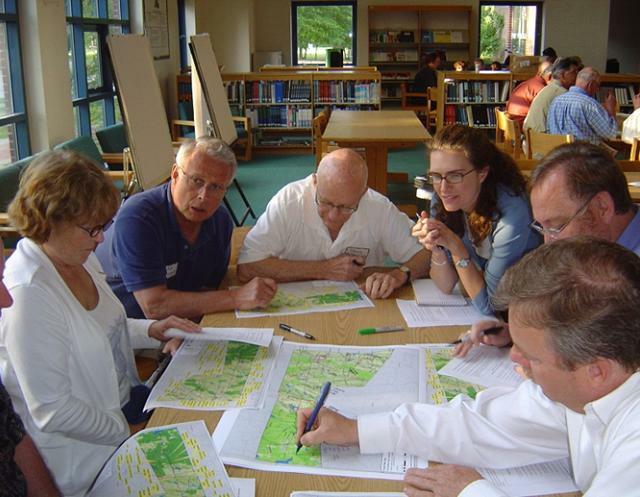 At the Orton Family Foundation we use an approach called Heart & Soul Community Planning, which strives to put community wisdom first in projects and uses design and planning professionals to help make the most of this valuable asset. This balance is also at the heart of CIRD’s approach to rural design, which is why Orton is excited to partner with Project for Public Spaces and the other CommunityMatters organizations on this program. 1.) Listen first. Community design projects need to begin with listening to what people value about their town and what concerns they have. This input will help frame the design issue with greater specificity, lead to new insights and ground it in the experience of a particular place. For instance, if you are looking at how to make a town more walkable, first ask people what they love about their town and how they experience it. This information will provide you with information about walkability and it also may point to some other underlying issues that design could address. We’ve found the use of personal story particularly effective for uncovering what people really care about in their towns. 3.) Create feedback loops. Make sure to have multiple opportunities for people to review your progress and provide feedback along the way. These loops will inform people of possible solutions to the design challenge, help refine ideas to fit the local context, and ensure a transparent community process. Feedback loops can be created through in-person meetings like a large community forum or a pop-up open house, online portals such as MindMixer or Engaging Plans, or targeted conversations with key stakeholders or groups in town. These three strategies bring the best of both sides to the table by allowing the community to define the design issue and the designer to respond to that challenge based on the specifics of a particular place. We look forward to the selection of this year’s CIRD workshop hosts (to be announced in early June) where we’ll work to achieve this balance in four rural communities across the US. —————- This update was cross-posted from the CIRD blog at rural-design.org. Click here to see the original post.